Erin Hernandez explains her research at the 2015 Undergraduate Research and Artistry Day. 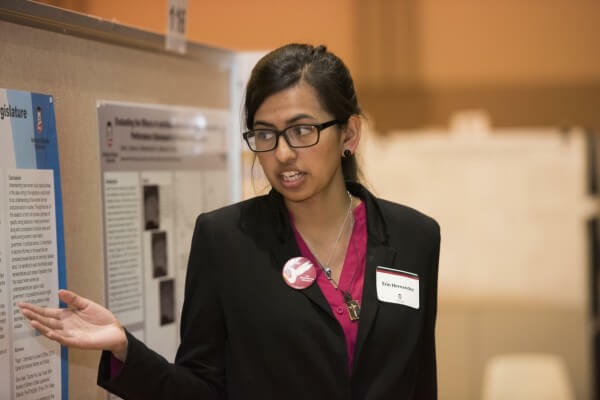 Hundreds of Northern Illinois University students participated in the university’s sixth annual Undergraduate Research and Artistry Day, which was combined with the Community Engagement Showcase for the first time ever on Tuesday, April 21. The event was the largest ever, and featured research, artistry and engagement projects from more than 350 students. The event was captured in the social media posts of participants and attendees throughout the day, as chronicled below and in the NIU Newsroom.